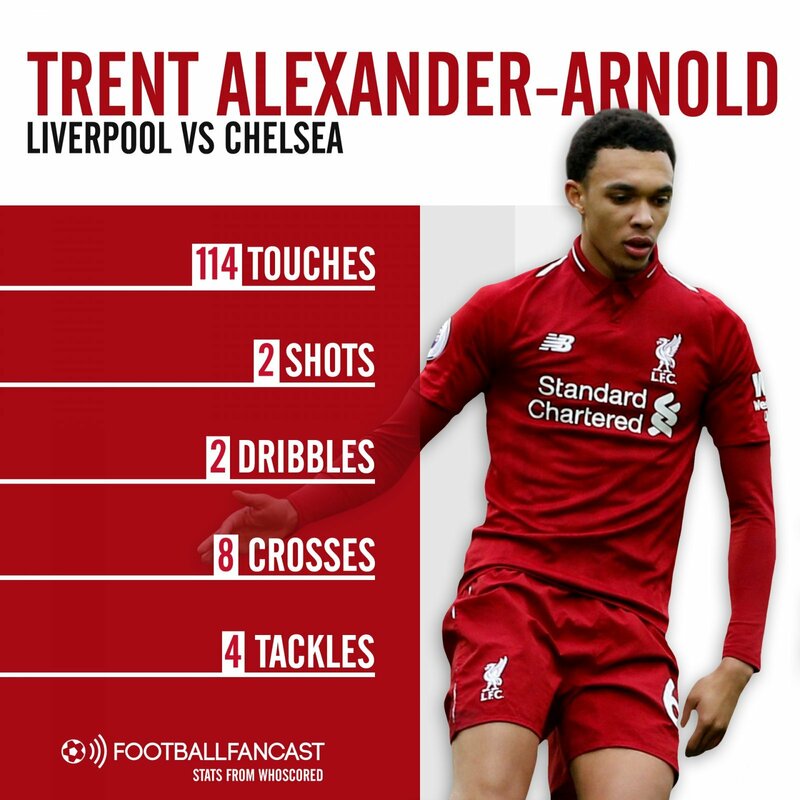 Liverpool romped past Chelsea thanks to Sadio Mane and a Mohamed Salah stunner on Sunday, but Trent Alexander-Arnold quietly put in perhaps the best performance of his career. Liverpool welcomed Chelsea to Anfield knowing the Blues love playing on Merseyside and anything other than a win would be seen as a failure by 99 per cent of those within the ground. And yet, barring a few shaky moments after they raced out to a two-goal lead in which Eden Hazard could have scored twice, the Reds never really looked too nervous or threatened by their London visitors. Granted, the Blues made life easy for Jurgen Klopp’s side at first by setting up with Eden Hazard down the middle, but once he switched back to the flank in the second half there was danger, and after coming through those two scares unscathed the Reds dealt with every problem admirably. However, Alexander-Arnold’s display seems to have gone overlooked, thanks probably to the excellent goal from Salah, emergence of Naby Keita and sheer dominance of Jordan Henderson in the middle of the park. The England international put in an incredible shift though, offering all his usual attacking impetus without sacrificing his defensive responsibilities. Per Whoscored, the 20 year-old touched the ball 114 times during the match, more than any other player, and made good use of the ball as well, always looking forward to find dangerous, incisive passes. He picked out eight crosses, and while only one of those was successful, it was certainly not down to a lack of quality delivery. Of course, the youngster already has one memorable performance to his name, shutting down a red-hot Leroy Sane in last year’s Champions League quarter-final first leg, but in many ways this was a far more complete performance. Against City for example, he displayed his defensive prowess, while in games this season against teams like Watford he has proved his class at the other end, scoring at Vicarage Road before providing a hat trick of assists against the Hornets at Anfield. However, his display against Chelsea really did have it all, and it was perhaps the first time he has put both sides of the game together quite so perfectly. As well as getting on the ball more than any senior player, skipping past Chelsea players at will and whipping in dangerous crosses for fun, he also completed four tackles, two interceptions and three clearances. At just 20 years of age, dropping such a well-rounded performance in the biggest game of his career to date shows immense confidence, the type of confidence that will make him a Liverpool legend one day.